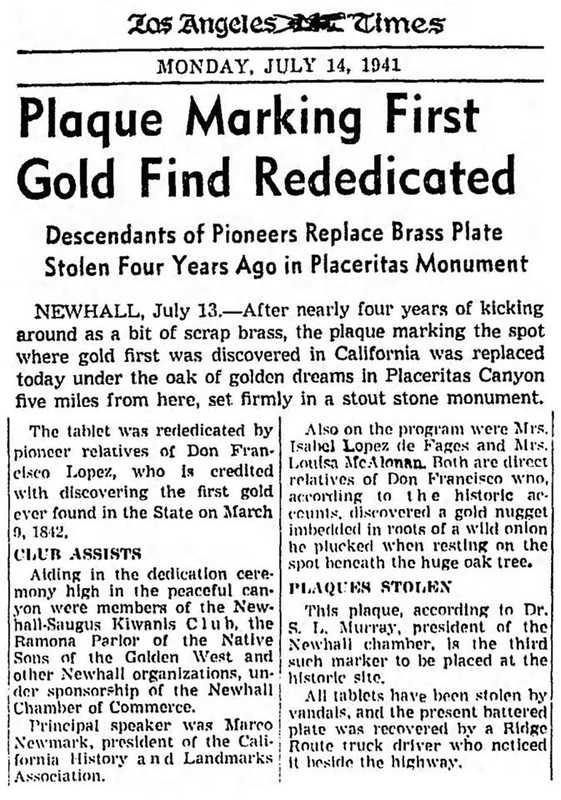 SCVHistory.com | Placerita Canyon | Stolen Brass Plaque Replaced at Oak of Golden Dreams, 7-13-1941. Stolen Brass Plaque Replaced at Oak of Golden Dreams. Event July 13, 1941 | News Reports. Plaque Marking First Gold Find Rededicated. Descendants of Pioneers Replace Brass Plate Stolen Four Years Ago in Placeritas Monument. Los Angeles Times | Monday, July 14, 1941. Newhall, July 13. — After nearly four years of kicking around as a bit of scrap brass, the plaque marking the spot where gold first was discovered in California was replaced today under the oak of golden dreams in Placeritas Canyon five miles from here, set firmly in a stout stone monument. The tablet was rededicated by pioneer relatives of Don Francisco Lopez, who is credited with discovering the first gold ever found in the State on March 9, 1842. Aiding in the dedication ceremony high in the peaceful canyon were members of the Newhall-Saugus Kiwanis Club, the Ramona Parlor of the Native Sons of the Golden West, and other Newhall organizations, under sponsorship of the Newhall Chamber of Commerce. Principal speaker was Marco Newmark, president of the California History and Landmarks Association. Also on the program were Mrs. Isabel Lopez de Fages and Mrs. Louisa McAlenan. Both are direct relatives of Don Francisco who, according to the historic accounts, discovered a gold nugget [sic: flakes] imbedded in roots of a wild onion he plucked when resting on the spot beneath a huge oak tree. This plaque, according to Dr. S[arah] L. Murray, president of the Newhall chamber, is the third such marker to be placed at the historic site. All tablets have been stolen by vandals, and the present battered plate was recovered by a Ridge Route truck driver who noticed it beside the highway.